From Aichi D3A1 Type 99 Dive Bomber that crashed in Aiea Heights above Pearl Harbor. Displayed at USS Arizona Museum. "This data plate was taken from the 393 liter gas tank I believe. 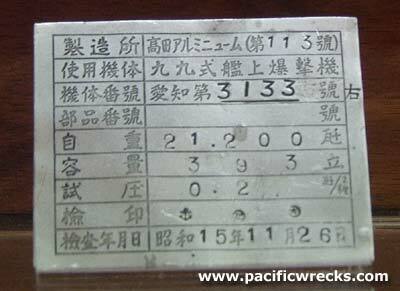 The serial 3133 could be the main airframe number or the tank serial"